24 • SPONSORED CONTENT • JUNE 2018 With some restaurants, speed of service can be especially challenging due to lack of back of house space. This was the case for The Hoppy Gnome, which opened in 2015 to fill a niche focused around the booming craft beer and taco segments. The 300-plus seat restaurant had its kitchen space reduced to only 400 square feet in order to maximize seating up front. Although it's not unusual in today's restaurants to minimize kitchen space, it can pose a challenge with high volume operations that depend on quick turns. "On a good Saturday, we'll bring in 1,000 people a day. It's hard to describe, people don't believe our volume, says executive chef Erick Millan. "We are a fast-paced restaurant, so the key is to bring food out fast and flip tables as quickly as possible. 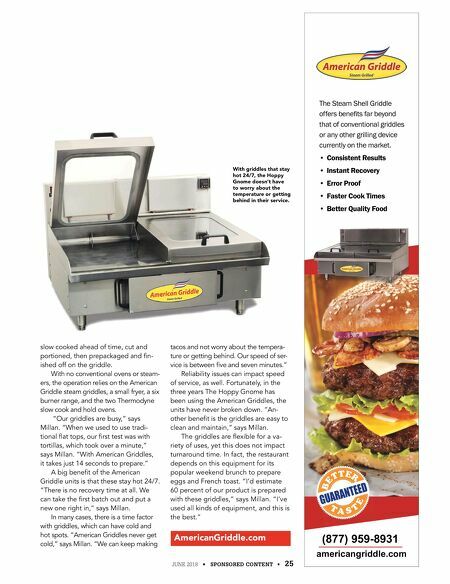 To do this, we look for equipment that saves us time." After six months of operation and guest feedback, the menu was expanded to include shareable small plates and a larger liquor selection. The downside was the kitchen seemed smaller than ever to accommodate the new menu items. The restaurant's long-term suc- cess hinged on the ability to turn out a larger menu quickly, while maintain- ing flavor and quality standards. 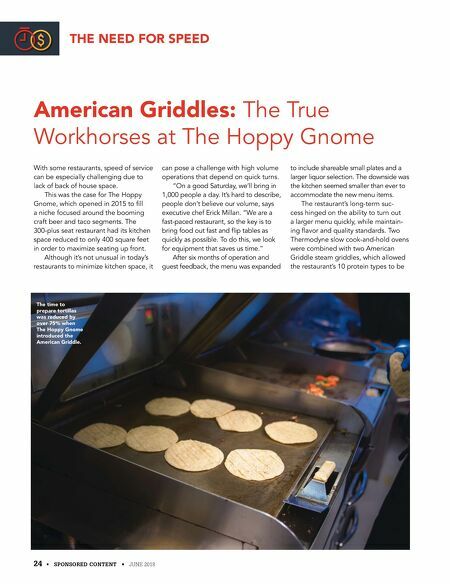 Two Thermodyne slow cook-and-hold ovens were combined with two American Griddle steam griddles, which allowed the restaurant's 10 protein types to be THE NEED FOR SPEED American Griddles: The True Workhorses at The Hoppy Gnome The time to prepare tortillas was reduced by over 75% when The Hoppy Gnome introduced the American Griddle.